We’ve tried to instill a spirit of thankfulness in our daughter from a very young age. 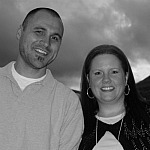 Saying thank you when someone helps you or gives you something is one of the simplest forms of that lesson. Now that she’s getting a little older, it’s time for her to express gratitude in a written form. Yes, we still believe in the power of a good old-fashioned thank you note. I can imagine that staring at a blank notecard is fairly intimidating, though, especially for the reluctant writer. This month we’re offering a solution that will help kids say thank you without the battle of writing a long thank you note. 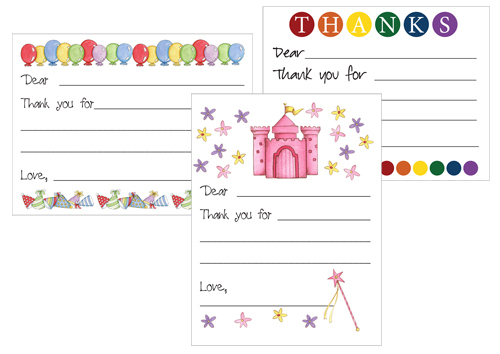 These fill-in-the-blank thank you notes give kids a starting point. They simply add the recipient’s name(s), what they’re saying thank you for, and their own name. Hopefully this make saying thank you a fun task! How do you encourage thankfulness in your kids? I love the party thank you notes, but cannot get the file to download. Please help! Thank you so much! These are very helpful. Thank you so much! My daughter picked out the princess themed ones and is filling them in as we speak! Oh, fun! I’m so glad to hear that! Thank you for doing this! My 7 year old has some cards to write and this is definitely going to help him. I appreciate this as I could never create something as nice as this! !